Has it really been a year since I last wrote a blog entry here? I know this is a slow blog but what happened? Well, I have to confess, this blog is much more of a vanity project than anything else, although I have always had a bit of a dream of making money from this blog, the truth is I have never made a penny! The meagre money I make from the sales of ebooks and whatnot don’t even cover the costs of running this site. My main income comes from running my training and consultancy business, teaching people NLP, communication, problems solving, critical thinking and learning strategies. I love what I do and in Rob Wringham’s definition of the word I have truly “escaped”, as Confucius once said “Choose a job you love, and you will never have to work a day in your life.” However, that doesn’t mean that everything is always sunny, rosy and walk in the park (unless it has escaped your notice, we have been through – and are still feeling the effects of – the worst economic downturn since the Great Depression). Last year was busy, very busy, I had a lot on my plate. So, taking my own advice, I ruthlessly applied the Pareto Principle (the 80/20 rule to those uninitiated – 80% of your output comes from 20% of your work) and cut and cut and cut. One thing that got cut at that time was this blog. It had to go. I had already, organically (by which I mean it was unplanned) been cutting back on the “slow” output, I had stopped my SlowCasts and abandoned my twitter feed and facebook page. It was no longer a labour of love, it had become a chore. I suffered from terrible writers block, I would open a Pages document with the full intention of writing an insightful and profound blog to inspire, inform and entertain my loyal and lovely readers and my mind would go blank. I would surf the net for inspiration and just find other people had written so much more eloquently on the same subject. I wondered whether the world needed another ego expressing his take on the same old banalities just to try and show how profound and enlightened he was. So I stopped, I focused back on my core output. I toyed with the idea of deleting this blog altogether, but I couldn’t bring myself to do it. I thought deleting all the old posts and start again. Then I thought about just deleting the “bad” posts and leaving the ones I liked, but the thought of wading through four years of posts overwhelmed me. I didn’t abandon this blog all together though, so I put into hibernation until something happened. 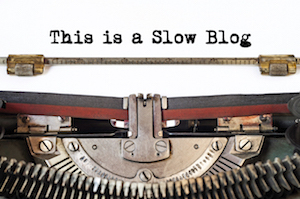 I still strongly believe in the Slow philosophy and, ironically stopping this blog was part of the philosophy. I had run out of things to say at that time. The slow life is the simple life, I tend to do the same things over and over again, I sit (meditate), I do Tai Chi, I go for run, I walk the dog, I read, I do some work. I endeavour to be mindful, unflustered and unhurried in all I do (and probably fail 50% of the time!). That is all, it is hard to find something new and unique and informative to say about that on a regular basis (I tip my hat to Leo Babauta at Zen Habits who has continued to come up with simple, interesting and original posts on the topic of minimalism on a regular basis). I needed a break. I never intended it to be a year, but life, as they say (whoever “they” is? ), is what happens whilst you are making plans. So, now what? Well, that is something I am still working on, but I hope you will join me on whatever this strange trip brings next….